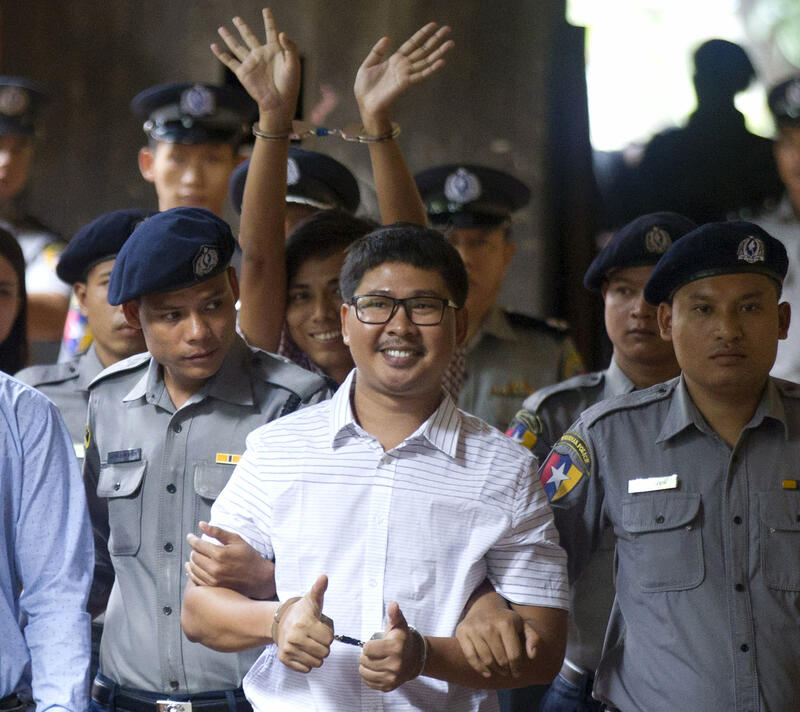 YANGON, Myanmar (AP) – On Monday, a Myanmar judge adjourned the verdict against two Reuters journalists who were accused of illegally holding official documents in a case that drew attention to the flagging press freedom in the troubled Southeast Asian nation Has. The two reporters have innocently declared themselves in favor of violating the colonial "Official Secrets Act", which includes a sentence of up to 14 years in prison. They were arrested in December and have been detained since they were refused bail. The reporters claim they were framed by the police when they reported Myanmar's brutal crackdown on Rohingya Muslims in western Rakhine] "We will not be afraid of the decision or the situations in which we find ourselves" Wa Lone said after the postponement was announced. "Because the truth is already on our side, we will not be afraid or scared because we did not do anything wrong." Reuters expressed disappointment that the ruling did not go as planned. "Wa Lone and Kyaw Soe Oo have already spent more than eight months in prison on allegations of a crime they have not committed," the international news agency said in a statement. "We look forward to receiving the verdict next week if we sincerely hope that they will be acquitted and united with their families." The two Reporters had investigated the assassination of 10 Rohingya by soldiers, police and Buddhist civilians. In a rare case in which security forces were punished for extrajudicial killings, the Burmese government later announced that seven soldiers had been sentenced to ten years in prison for serious killings. The government has denied widespread abuses, but access remains limited in Rakhine. It insists the crackdown was a justified response to coordinated attacks by militant Rohingya, which killed a dozen security forces. Kyaw Soe Oo, 28, and Wa Lone, 32, witnessed harsh treatment at their first interrogations. They lost several appeals on bail. Police whistleblower Moe Yan Naing was detained for one year for violating police regulations and his family was thrown out of the police station. The documents presented as evidence in court appeared to be neither secret nor sensitive. The reporters testified that they did not ask for or knowingly possess any secret documents. "Forcing these two Reuters reporters to go to jail for another week just because someone else can not read an already-written verdict shows how healthy it is in Myanmar's justice system," said Phil Robertson, deputy director for Human Rights Watch in Asia, in a statement. "These two reporters should never have been brought to justice because they worked as journalists, but apparently the government is more interested in using this process to intimidate the local media than anything else." The case has given up hope for a new era of freedom of expression under the government of Aung San Suu Kyi, whose National League party for democracy came to power in 2015 after five decades of military control. The case of Reuters reporters is only the last of their reign, in which the courts have aggressively prosecuted dozens of journalists, along with other attempts to suppress and discredit the media. Earlier this month, US Secretary of State Mike Pompeo urged Myanmar to release the two journalists immediately. Pompeo tweeted that he voiced US concerns about the arrests of reporters when he met with representatives of Myanmar on the sidelines of a regional meeting in Singapore.